M started preschool today. I am in disbelief. Why is she growing up so fast? She was a tiny little baby just yesterday. My separation anxiety is much greater than hers. I needed something crunchy to get over it, maybe something cheesy, or both? 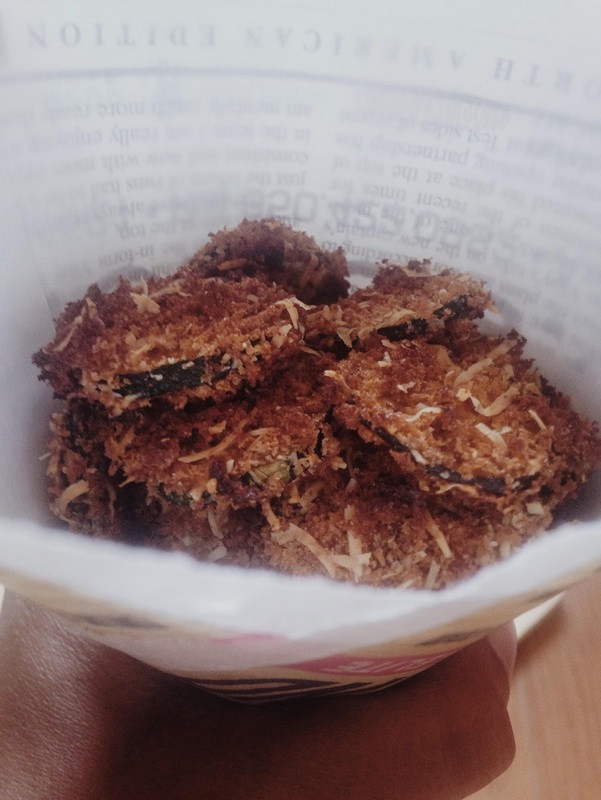 Ladies and gentlemen, I give to you – Zucchini Parmesan Crisps, a perfect juxtaposition of salty parmesan, crunchy breadcrumbs and creamy soft zucchini. 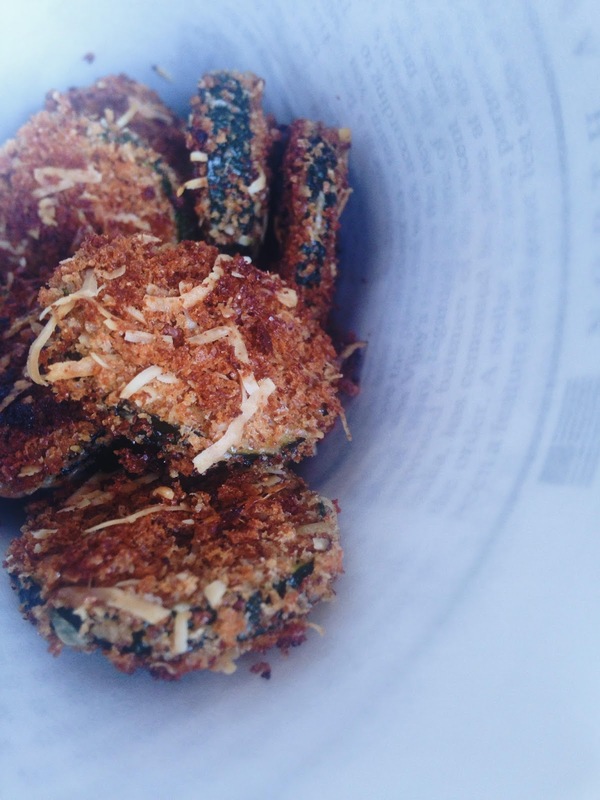 This recipe is adapted from Ellie Kreiger’s Zucchini Parmesan Crisps. It’s great because it’s egg less and doesn’t involve frying (and God knows how I hate frying). Slice Zucchini into 1/4 inch thick rounds. Toss them with olive oil, salt and pepper and set aside. In another bowl, combine the breadcrumbs*, cheese, chili powder and garam masala. Parmesan is usually slightly salty so add salt accordingly. 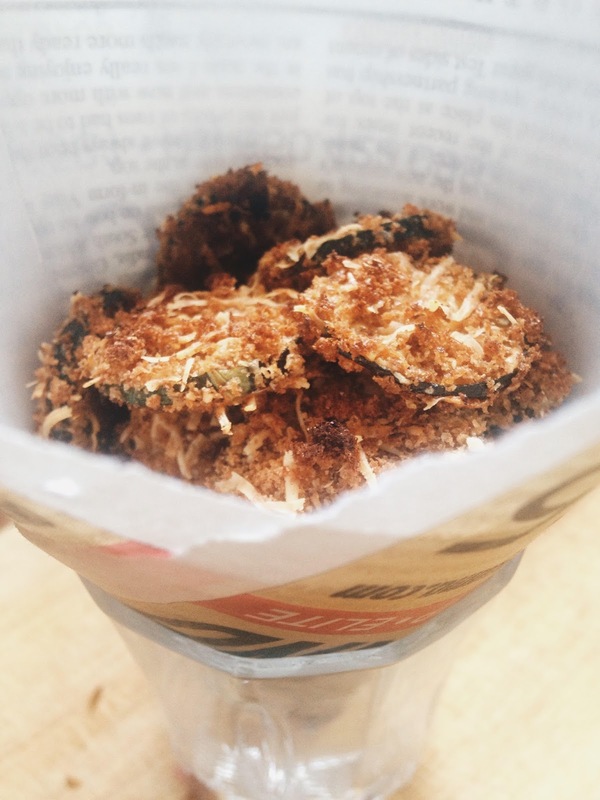 * I usually use Panko for breadcrumbs but you can also make your own. Just pulse a couple slices of bread into crumbs. Heat some butter and saute these crumbs until they’re golden brown and crispy. Dip each zucchini round into the breadcrumb and Parmesan mixture and press down so that it coats the zucchini round. Place it on a sheet pan in a single layer. Bake at 425 deg F for about 10-15 mins (depending on your oven) or until they’re golden brown. It’s a perfect healthy snack. Enjoy!